Wombats are an iconic part of the protected fauna of NSW. They are extremely strong and determined animals and many of the conflicts between wombats and people can be resolved by learning about the behaviour of wombats and understanding their habitat needs. Wombats are one of the world’s largest burrowing animals, amongst the largest marsupials and are the largest herbivorous burrowing mammal. They are pouched mammals like kangaroos, possums and their closest relative, the koala. Wombats have long claws and very short, stocky limbs that are adapted for digging and they live in burrows from which they emerge at night to feed. Wombats have a backwards facing pouch. This is to stop dirt entering the pouch when the mother is digging. While their eyesight is poor, wombats have a keen sense of smell, excellent hearing and very large brains. Wombats sleep most of the daylight hours, to conserve energy and water which aids survival. The bare nosed wombat (Vombatus ursinus hirsutus) is the only species found in NSW. They prefer temperate forested areas of the coast, ranges and western slopes. Slopes above creeks and gullies are favoured sites for burrows and they like to feed in grassy clearings, including farm paddocks. Bare nosed wombats were once widespread from south-eastern Queensland, through NSW along the Great Dividing Range and most of Victoria. Now they have a fragmented distribution in NSW, being most abundant in the south-eastern parts of the state. Remaining populations are under continued pressure from land clearing, road mortality, disease and illegal shooting. These pressures may be acute for some local populations. Wombats’ burrows range from two metres long up to 30 metres long and up to four metres deep. Deep burrows provide protection against extreme climatic conditions where the above ground temperature ranges between sub-zero in winter to more than 40°C in summer. The even temperatures in the burrows help wombats conserve energy and the higher humidities mean that wombats lose less water while breathing. Wombats mostly eat grass. Their teeth continue to grow all their lives. They have extraordinarily slow metabolism, taking around eight to fourteen days to complete digestion that aids their survival in arid locations. Wombats usually drink at dusk although in some areas may get enough moisture from dew and grasses. For Wombats dangers include: destruction of their natural habitat, competition for land and food, predators such as dingoes and humans, parasite infection (mange), floods, fire, drought and cars. Rescuers checking dead or injured wombats should always check for a joey. A wombat joey can live up to 5 days inside the pouch AFTER the mother has died. In some roadkill cases, the joey may have been flung out of the pouch during the impact of the accident. It may be on the road near the mother, or if it is bigger (around 2 kilos) the joey may have left the mother’s pouch and be hiding nearby. If a live joey is in the pouch it can very gently be removed, but preferably Wildlife Rescue South Coast should be involved. Removal of the joey should not be forced or do not yank at the teat as it will cause damage to the joey’s mouth and jaw. Instead use scissors or a knife and cut the teat. Once the joey is removed from the dead mother, it needs to be wrapped immediately in something made from soft natural fibres (wool, cotton, hemp) and kept warm, dark and quiet. Human body temperature is good for young wombats, particularly if the joey has been out overnight and is cold. At this point it needs to be left alone and kept warm, dark and quiet. Get help immediately. Do not try to feed the joey anything. It will survive a lot longer without food than it will if given the wrong type of milk. Joeys coming into care following an attempt by untrained people to look after them usually die. They need rehydration, special marsupial milk, special teats to avoid inhalation pneumonia, correct temperature and those involved in vehicle collisions often need treatment for wounds and bruising. © A Wombat in WRSC care recovering from mange. Mange is an infestation of the mite Sarcoptes Scabeii the same mite which causes scabies in humans and mange in dogs. In wombats, the female mite buries into the flesh and tunnels through it depositing eggs as well as her waste. The wombat reacts to this invasion in a process which causes a dysfunction in the keratinisation process and this leads to thick scabby plaques developing all over the animal’s body. The scab draw the body together, so often the impression given by a completely manged wombat is of a hunched up creature walking on its toes. The skin cracks and fissures become infected and flyblown and full of maggots. The animal reeks of rotting flesh, scabs grow over the eyes and eventually the animal dies a slow painful death. Usually many months of suffering have occurred prior to death. 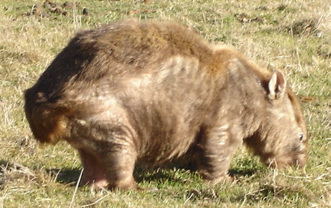 The death of a heavily infested wombat in its burrow, if shared with another wombat, is the most likely means by which an intense load of mites will be transferred to another wombat. How can mange be stopped? Stopping mange has to start by getting people to know enough and care enough to take action. For some reason some of these animals often come into dangerous situation they normally would avoid and are often reported under houses and in people’s backyard. Whether this is interpreted as them seeking help or trying to find water or fresh grass remains untested, but these are the few that get observed and have any chance currently of being treated. Treating wombats with early stages of clinical signs will lead to complete resolution of mange and the wombat will be healthy and not more likely to become reinfested, probably less so.